Give your child the action-packed Kids Martial Arts classes at Kernow Martial Arts and you're bound to witness an amazing transformation! From a new found passion for physical fitness, to steadfast discipline and unwavering self-confidence, our Kids Martial Arts classes have so much to offer. The goal of Kernow Marital Arts classes is to make your child feel so good about themselves that they don't give in to peer pressure that meet our kids far earlier than we'd like. We believe in building confidence, strength and discipline, and on top if it all, we'll forge important leadership skills and strong character qualities that will set your child apart from the pack, establishing a great foundation for success. TRY THESE INCREDIBLE KIDS MARTIAL ARTS CLASSES IN ST. AUSTELL! 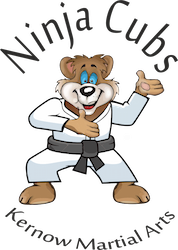 The objective of the Kernow Martial Arts' Ninja Cub program is to prepare 4-6 year old children before they enter the Junior classes. The benefits of KMA Ninja Cubs is that it teaches children from a very young age the core values that we wish from our children throughout their life while developing their balance coordination and motor skills. Our classes are taught with traditional values of discipline, respect and hard work. In addition to their normal training students will be enrolled into our highly successful Character Development program. Our Junior Freestyle classes have been designed to teach children our Freestyle Martial Arts, which takes the most effective techniques, attitudes and training routines from a variety of Martial Arts sources to combine into our system. Influenced by Taekwondo, Karate, Thai Boxing, Jiu Jitsu and Judo, our Junior Freestyle Kids Martial Arts program will give your child the skills to succeed, not only in the Martial Arts, but in school and athletics as well! GIVE YOUR CHILD A KICK START WITH KERNOW MARTIAL ARTS! With each Kids Martial Arts class, our students develop poise while improving strength, balance, coordination and self-esteem. Our Kids program provides healthy, safe, fitness-focused classes the enhance your child's positive attitude and academic performance. With new Kids Martial Arts classes at Kernow Martial Arts, there's no reason to wait! To learn more, just complete the short form on this page. We'll give you all the information you need to get you child started in fun and rewarding Kids Martial Arts classes at Kernow Martial Arts!